Pan Asia Bank further expanded its branch network today (June 30) with the opening of its 51st branch in Peradeniya, at No 767, Sirimavo Bandaranayake Mw. Peradeniya. 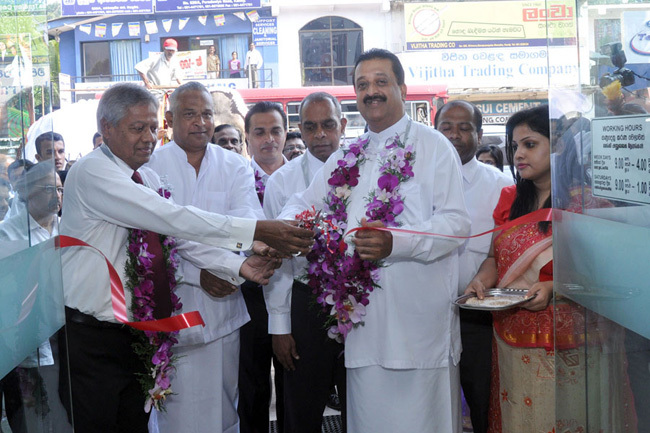 The inauguration of the new branch was marked by the Chief Guest his lordship Raja Pushpakumara - Mayor of Kandy municipal council and the guest of honour Mr. A.G. Weerasinghe – Chairman Pan Asia Bank. Pan Asia Bank has already opened nine branches within the year, and continues its vigorous expansion drive with a view of achieving 25 new branches in 2011 and 100 branches by the end of 2012. Pan Asia Bank takes pride in its customer centric focus and will be offering a highly personalized service, competitive deposit and loan rates and an array of novel banking products including Champion Saver account with a very attractive interest of 8% for a savings account, three types of minor savings accounts, Gold Loans with the highest advance amount up to Rs 41,000/- per sovereign, and leasing at the lowest market rate down to 1%. Pan Asia bank Peradeniya branch is headed by Mr. Anuradha Wickramasinghe. The branch will be opened from 9 am to 4 pm on weekdays and from 9am to 1 pm on Saturdays.